The spiritual battle between the forces of Jezebel and the spirit of Elijah is increasingly clear. The modern-day false prophets of the news media accuse, mock, and degrade those who stand against the demonic systems at work in our nation – and their predictions are dire. Many believers are running from the battle out of fear of man, personal offense, or lack of faith. Even so, many have heard His voice and are assured of the victory, determined to stand strong. It is not about the numbers, but about obedience. It is not about performance nor is it a war of words. It is a spiritual battle that can only be won in and by the Spirit. We can agree with, and activate, heaven’s purposes in this election if we see our vote as heaven does – a prophetic act of our faith. If we see our vote as having spiritual authority and power, this will signal our agreement with God’s purposes and open the way for miracles. The power of our faith cannot be diminished in this process. This election is not just about electing a president. It is about purifying a people. It is the Bride’s purification rites (Ephesians 5:25-27). God has been searing our hearts and sanctifying our minds to be prepared for the new wine that is to be poured out. He is molding and shaping us into a people of His Presence and carriers of His authority and power, rightly discerning the character and movements of His Spirit. We are being tested to live by faith and not by sight; to live by what is unseen rather than what is seen (2 Corinthians 4:18). We must see this through to the end and cannot be disturbed or distracted by the propaganda of today’s media manipulation and false prophecies. On Mt. Carmel, Elijah built an altar and made a sacrifice. In like manner, we as believers must come to the altar of God’s Presence and sacrifice our perceptions, our ideas, and our methods of warfare and surrender to His. Elijah’s faith was such that even as water was poured on the altar – three times – his faith did not waver. To destroy any hope in our future, the false prophets and manipulators of news will continue to pour out information that will seem to destroy all likelihood of a victory or possibility of breakthrough. Their attempts to dampen faith and hinder any move of God will be extreme. But, their vitriol will only set the stage for signs and wonders so profound, only God will get the credit. The Lord has already determined the outcome of this election because of the continual prayers of believers. As soon as we collectively turned out heart to heaven for help – even years ago – the answer was on its way (Daniel 10:12). He has heard our cry and has made up His mind. Nothing can thwart it. Even so, we have a part to play to see the fulfillment of His purposes. We may stand in faith, but our faith without deeds is dead (James 2:26). We can activate heaven’s outpouring through one simple prophetic act – vote. Our vote can be a demonstration of our faith in full expectation of heaven’s return. We are prophesying through our vote that God will have His way. To not vote is to be void of faith. 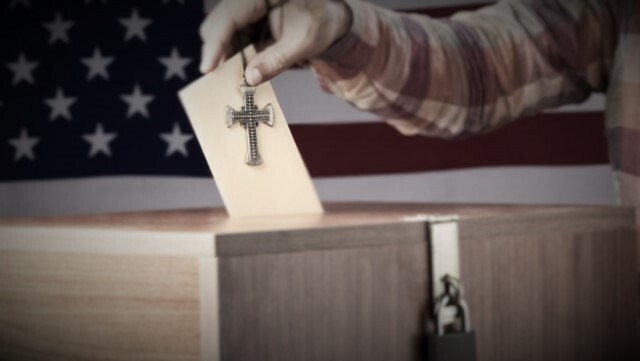 In essence, faith without voting is dead. The call from heaven is to vote as a prophetic act that demonstrates a heart that is fully convinced of God’s word and His purposes in this hour. The election will not be determined by the American electoral system for God does not look at numbers, but at hearts that are pure and faith that is active. As believers cast their vote, it will be marked in heaven, signaling the agreement between heaven and earth. Know that to vote is not simply a right as an American citizen. It is a powerful demonstration of faith that will carry spiritual authority to open gates and vanquish foes. Pray as you go and register your faith as you vote for God’s choice.